I apologize for my failure to post this week--I've been trying to get back into the swing of life and just never got around to writing anything. I promise to post more next week! 1) I broke my left wrist twice in the same year when I was 10. I fractured the growth plate while roller skating both time--and the second time happened while I was skating with the safety patrols. 2) Remember that show, "Press Your Luck?" 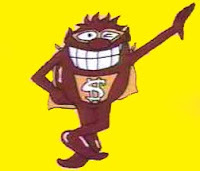 The whammies were my imaginary friends growing up. 3) I have only recently begun eating asparagus and avocado. 4) As much as I've enjoyed being a total slug this summer, I'm looking forward to getting back to a regular schedule--but that won't happen for another couple of weeks still. I'm especially looking forward to getting on a normal cooking schedule--then I'll have more to write about! 5) I'm taking a day off from yoga and it's really weird. I already went Monday-Thursday and will go again on Saturday and 2 classes on Sunday. When did I become that person? 6) I stopped writing for 10 minutes halfway through this post because Millie wanted me to pet her. Millie is on the left. 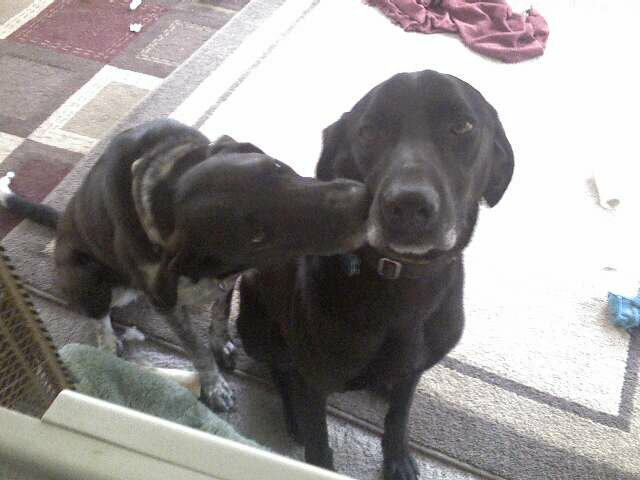 Rowdy is on the right. She looks like she's kissing him, but really she's just chewing his face. 7) I'm normally a prolific reader, but I have yet to finish reading a single book this summer. 8) I am a die hard Harry Potter fan (no, really!) and have yet to see Harry Potter 7.2. I was in California when it came out and never made time to go see it once I got back. 9) I really need to add some more cardio and/or weight training to my schedule--but I have trouble staying motivated unless I have a person or group to do it with me. I swear, I meant to start New Rules of Lifting For Women this summer, I just never got around to it. 10) I've donated my hair four or five times now. The last time I donated, I said it would be the last... but my hair is getting long enough that I'm thinking about doing it again. I hope everyone out there has had a great week and has a relaxing weekend ahead. We've got a weekend full of celebrations planned. Are you up to anything exciting? I haven't seen HP 7.2 either! And I'm out of town this weekend and next... I'm starting to worry I won't get to it while it's still in the theater! The 2001 version of myself is mortified. We need to make a date--America Eats + Harry Potter!